Maldivians have organized their lives based on a system on Nakaiy. Each Nakaiy is 13 or 14 days long and is divided into two seasons; iruvai northeast monsoon and hulhangu south west monsoon. The Nakaiy calendar is still used to determine such things as the best time for fishing, travel or planting crops. The Maldives has a tropical climate with warm temperatures year round and a great deal of sunshine. The warm tropical climate results in relatively minor variations in daily temperature throughout the year. The hottest month on average is April and the coolest, December. The weather is determined largely by the monsoons. There is a significant variation in the monthly rainfall levels. February is the driest with January to April being relatively dry, May and October records the highest average monthly rainfall. The southwest monsoon or hulhangu moosun from May to September is the wet season. Rough seas and strong winds are common during this period. The northeast monsoon iruvai moosun falls between December to April. This is a period of clear skies, lower humidity and very little rain. 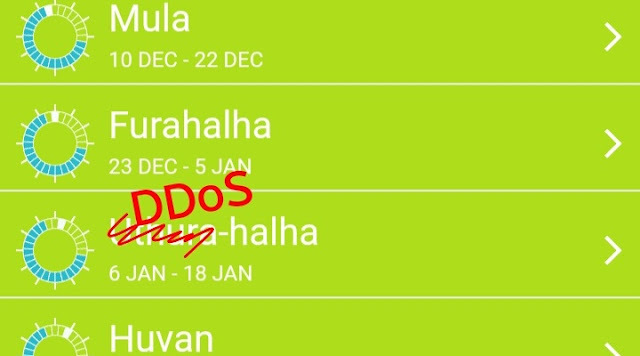 Uthurahalha continues from January 6 to 18. This particular Nakaiy is known for the clear blue skies, strong wind and rough seas. In this technologically advanced age, Maldivians are more concerned about the availability of internet service but not farming or fishing. Their life becomes harder when internet is disconnected for a single second. They do not want excuses from service providers regarding the reasons which make their internet connections slower. Almost all Maldivians are computer literate and depends heavily on electronic devices and internet. The hardship brought by the DDoS attacks on the county's two major service providers has finally resulted in people renaming the ongoing Nakaiy from Uthurahalha Nakaiy to DDoS-Halha Nakaiy. Jan 19 to Jan 31 Huvan, Calm seas, blue skies. Fishing in the east is good. Feb 14 to Feb 26 Hiyaviha, Seas are calm, days and nights are hot. Mar 26 to Apr 7 Reyva, If storms occur they may be severe. Fishing is good in the north. Some trees are cut down and burnt. Apr 8 to Apr 21 Assidha, Begins with a storm, then becomes hot and dry. People allow themselves to be wet by the first rains, believing it will bring them good luck. Fishing is poor, millet and trees are planted. Apr 22 to May 5 Burunu, Begins with a storm and strong winds, then becomes calm. Fields are cleared, trees chopped and seeds sown. May 6 to May 19 Kethi, Dark clouds, frequent rains. Dried leaves are burnt and the ashes spread over the fields. Sowing continues. Jun 3 to Jun 16 Miyahelia, Storms, rough seas and strong westerly winds. Fields are sown and weeded. Jun 17 to Jun 30 Adha, South westerly winds, light rain and schools of fish. Fields are weeded and transplanted. Jul 1 to Jul 14 Funoas, Storms and rough seas with frequent sudden gales. Weeding and transplanting continues. Jul 15 to Jul 28 Fus, Wet and overcast. Fishing is good. Jul 29 to Aug 10 Ahuliha, Less Frequent storms, calmer days. Grain harvests are reaped. Aug 11 to Aug 23 Maa, Generally calm. Harvesting continues. Aug 24 to Sept 6 Fura, Isolated showers, usually dry with light north westerly winds. Harvesting continues. Oct 18 to Oct 30 Hey, Strong winds from all directions.Fishing is excellent and the markets are filled with large tuna. Nov 1 to Nov 13 Viha, Calm days. Fishing is good. Nov 27 to Dec 9 Dosha, Light north-easterly winds. Good fishing.